EIA has developed an interactive dashboard that provides daily and weekly contextual information to the Weekly Natural Gas Storage Report (WNGSR). The new dashboard shows Lower 48 and regional storage activity and key market fundamentals that affect underground natural gas storage activity. The WNGSR is one of the U.S. government's Principal Federal Economic Indicators (PFEI). Most of these indicators, which include metrics such as employment, international trade, housing construction, and crop production, are released monthly or quarterly. EIA will post updates to the dashboard in the mid-afternoon on the same days EIA releases its latest weekly natural gas storage estimates, which is usually on Thursdays. The dashboard will follow the WNGSR holiday reporting schedule. The dashboard includes the Lower 48 and regional natural gas storage inventories, net inventory changes, and utilization indicators. Other metrics include temperature visualizations, estimated natural gas consumption by sector, net exports, and futures prices. Information sources reflect a combination of EIA data and third-party data. Key sources of non-EIA data include temperature data from the National Oceanic and Atmospheric Administration (NOAA), natural gas demand and import/export data from OPIS PointLogic, and natural gas futures prices from CME Group and Bloomberg. EIA has incorporated many interactive features into the dashboard, such as the ability to select national or regional information, choose specific years or ranges, animate trends, and download selected data series or images. In addition to the data visualizations, the commentary section will provide analysis of recent natural gas storage-related market conditions. 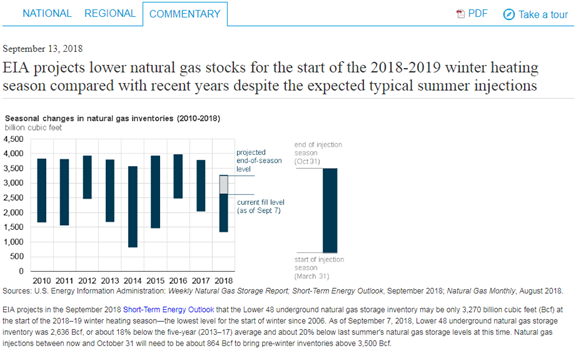 These entries will focus on many aspects of the natural gas storage market, such as potential drivers of changes in storage inventories, occasional details on EIA-derived storage statistics, and trends in natural gas storage infrastructure.